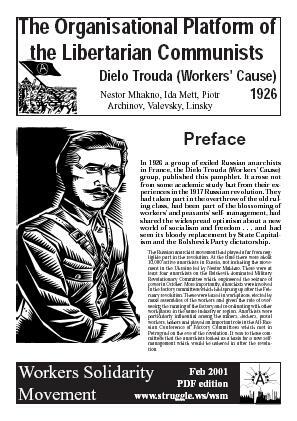 In 1926 a group of exiled Russian anarchists in France, the Delo Truda (Workers' Cause) group, published this pamphlet. It arose not from some academic study but from their experiences in the 1917 Russian revolution. They had taken part in the overthrow of the old ruling class, had been part of the blossoming of workers' and peasants' self-management, had shared the widespread optimism about a new world of socialism and freedom . . . and had seen its bloody replacement by State Capitalism and the Bolshevik Party dictatorship. Now also available as a PDF file for you to print out and distribute. First Irish edition published by the Workers Solidarity Movement.